Etron Fou LeLoublan - "Les Sillons De La Terre"
The Musea Records sub-label, Gazul, continues it's series of Etron Fou LeLoublan CD reissues with Les Sillons De La Terre, the bands fifth (and next to last) album from 1984. The band is still a quartet, with Guigou Chenevier on drums and vocals, Ferdinand Richard on bass, Jo Thirion on keyboards, and for this album Bruno Meillier replaces Bernard Mathieu on saxophones. I can't emphasize enough what a truly unique band Etron Fou was. Of course, so were Henry Cow, Univers Zero and the other original Rock In Opposition bands. But Etron Fou was in a league of its own. They were poles apart from the dark and deeply intense Univers Zero, instead creating a quirky and good humored brand of avant-rock, and a sound that has informed the music of many others since. With Les Sillons De La Terre, Etron Fou is still very much a rock band, many of the songs bearing similarities to those heard on the previous album, Les Poumons Gonfles. But Meillier's saxophone style brings more of a free-jazz element to the mix. Other than this the only other exposure I've had to Meillier was an album by another 1980's band he was in called Les I. But a quick Google search reveals that he has an extensive resume of collaborations. Most of the tracks on Les Sillons De La Terre are in the 4 minute or so range, but Etron Fou nonetheless manage to stretch out instrumentally, making adventurous compositional statements without the need for lengthy jams. But these are also songs, and Chenevier and Thiron's vocals are both trademark stamps on the bands sound. 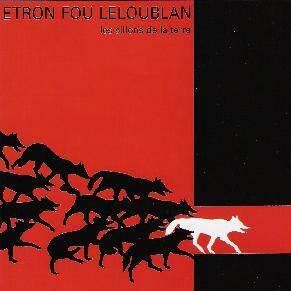 In short, Etron Fou LeLoublan is essential listening for any student of the Rock In Oppostion, avant-garde school of progressive rock. Newcomers should start with the albums that feature the quartet version of the band, after Jo Thirion came on board.